On December 3rd of last year, I spoke at the very first Ziglar Women Faith and Family conference. My Mom has been traveling and speaking with my grandfather the past several years as well as editing his books and in the fall of 2011 the idea of putting together a conference for women was birthed in her heart. My oldest sister, DeDe had been speaking for business women and in real estate circles for a while and I have been teaching in YWAM training schools for a few years so we put our heads and hearts together and the Ziglar Women Faith and Family conference was born. Right around this time Phoebe was getting sick. I remember the internal battle I had the day of the conference because Phoebe seemed so lethargic and I felt guilty leaving her when she wasn’t feeling well. I had no idea that a baseball size tumor was in her little head and that the pressure was making her miserable. I thought maybe she was coming down with a tummy virus. 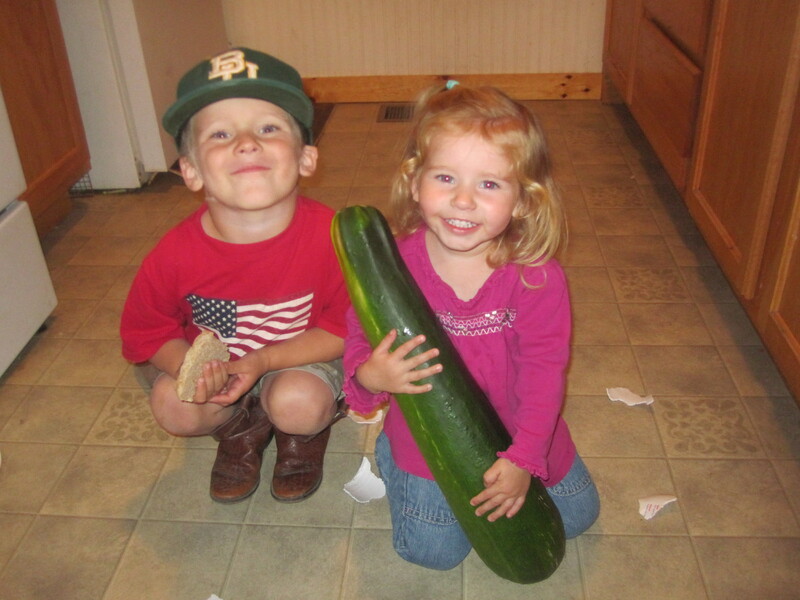 This is what she looked like then…. The conference ended up being a wonderful experience. It was a different format than I was accustomed to and I was nervous about how it would all fit together, but God blessed the whole day and I found it an awesome priviledge to be able to share what He has done in my life with all those women. On December 17th Nathan and I packed up our little apartment at World Hunger Relief in Waco TX and loaded up our vehicles with our belongings. Phoebe wandered around in tears until she fell asleep on a bag of blankets. She was not doing well. The next few weeks as we traveled for the holidays, we were in and out of the ER at 3 different hospitals. She was dehydrated, but how could that be? She was drinking 4 or 5 sippy cups of water a night! She was losing weight and she was pale and from time to time she would vomit for no apparent reason. It was a stressful time and I was wracked with worry for my girl. On January 1st I took her back to the ER at Children’s Medical Canter and asked for a scan of her brain. The night before she kept saying “my noggin, my noggin..” and holding her little forehead. Then she would say “my eyes, my eyes..” and cover her eyes even though the room was completely dark. Fifteen minutes after the CT scan I was told she had a “mass” on her brain. And that’s where this blog starts…and this whole big wild story. At first our family decided to suspend the Ziglar Women conferences indefinitely. How could we pioneer a new ministry in the midst of such a trial? What if we lost her? What if this changes everything? We didn’t even talk about it. Mom had already signed a book deal with Guideposts and was in the middle of working on her manuscript when all of this happened. I don’t know how she endured to the end of that process…she took 3 shifts a week at the hospital and wept with me, and brought me coffee and helped give ice baths when Phoebe’s fevers rose to 105 after brain surgery. We all took turns sleeping in Phoebe’s bed and holding her arms to quiet the tremors her body was having as her brain tried to heal. It was a total shift. Survival mode replaced any thought of future ministry plans and conferences…we let it go. And then encouragement came from several places, to allow God to use our trial. See, at the Ziglar Women conference on December 3rd I had taught from the book of Job. I shared about surrender and laying down your rights and knowing that God is God and I am not. I thought laying down my right to marriage and my right to live in America was noteworthy. Until God asked for Phoebe. It never occured to me that He might ask me for something so precious to me as my child. Everything in me is built to protect her and nurture her and preserve her and at a moments notice I would throw myself into oncoming traffic to save her life. 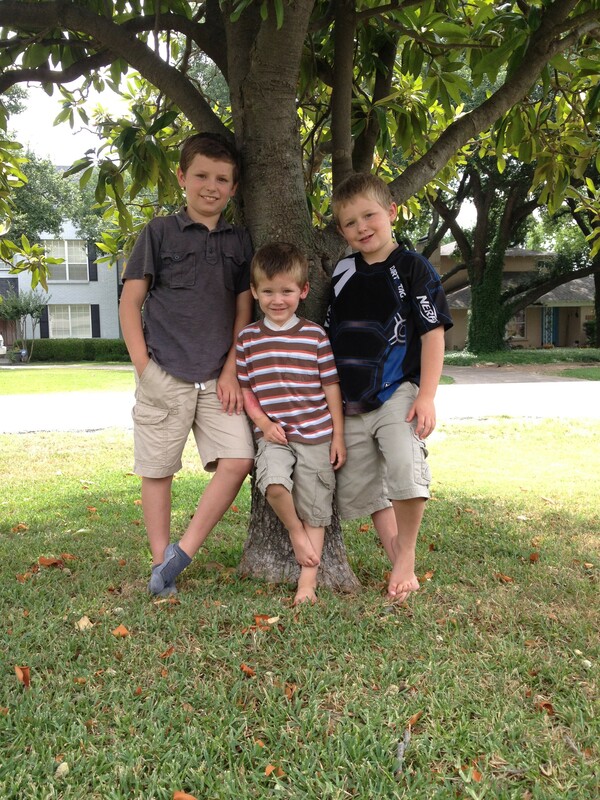 I have often prayed that God would use my children for the purpose of furthering His kingdom. I thought that might require me to someday entrust my kids to God as they went off to the foreign mission field or that Him using them would mean that they reach out to others more needy with the love of Jesus in whatever place God has them. But cancer? For my TWO year old, only daughter? How could He require me to trust Him to this degree? We got brave and took Phoebe to our annual YWAM Tyler staff conference at a hotel nearby this past weekend. 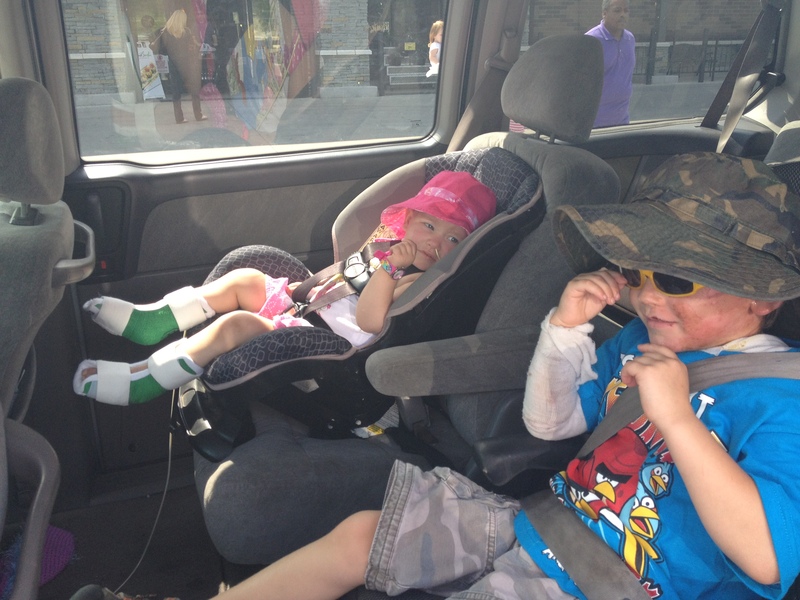 It was the first time since her diagnosis that she has spent a night away from either our house or the hospital. She loved being in a new place with new people and looking at all the waterfalls in the hotel lobby. Nathan’s Mom went with us and stayed with Phoebe and Deacon so that we could attend a couple of sesssions of the conference. Ben and Averic got to do VBS and swim with all their old buddies which was just over-the-top fun for them. It was a great time for everyone. It was so nice to be surrounded once again by those who know and love our family and to see just how many people are really invested in praying for Phoebe. We couldn’t ask to be a part of a better ministry family, they blessed our socks off! Phoebe had a clinic visit today to have labs drawn and everything is looking good. She does have a little cold and some coughing and sniffles, but her blood counts are over 9,000 now so her immune system should kick this bug before too long. Benjamin came with me today to clinic and brought his school work. He is growing up so much and is such a big help to me these days. He carried bags and helped me with her feeding pump and entertained Phoebe while we waited for her labs and somehow managed to complete his school work in between all of that. I was so thankful to have a him along today. On Friday Deacon has another follow up burn appointment. His burns are looking so good and the two little spots that were not quite healed last week look great! I expect that after Friday he will be done with bandages and that will be nice. We will have to keep him out of the sun for the rest of the summer (oh me) and slathered up with sunscreen any time he might be exposed. 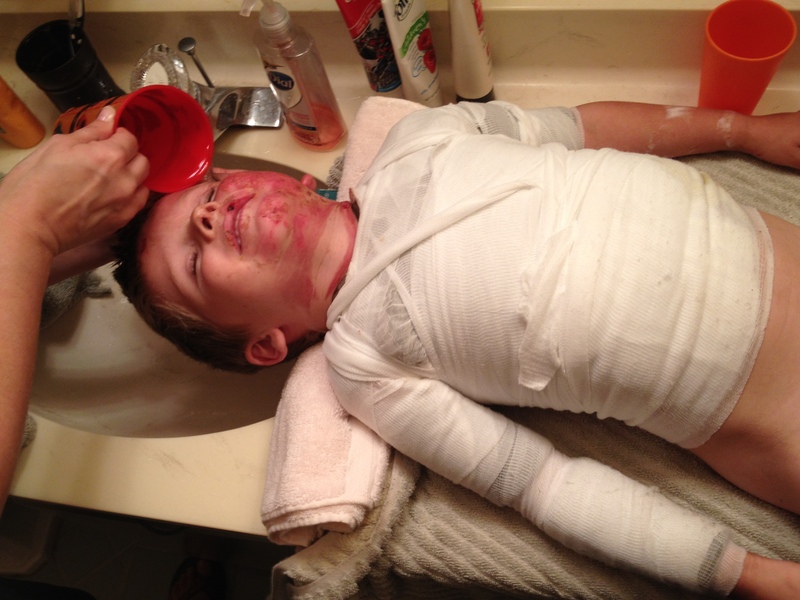 The new skin is susceptible to bad burns so we have to be extra careful. On Monday Phoebe will start her next round of chemo and we might possibly be doing it out-patient for the first time if we can get her home-health physical therapy set up. If not, we will go in-patient so she can continue to receive her occupational and physical therapy each day. We are also tweaking her formula feeds through the ng tube and trying to work on cutting back on the formula so she will desire more table food and drinks. This can be tricky with her Diabetes Insipidus because it messes with her fluid intake, but I would love to ditch that little black backpack she is always attached to any day! Having my girl tethered to something continuously is not my favorite. So, here’s to eating and walking! It’s liek starting over again with all of these abilities she once had. Sometimes it’s hard for me to imagine that she use to climb up into her booster seat and sit down and eat a meal with us. I pray for those days again. 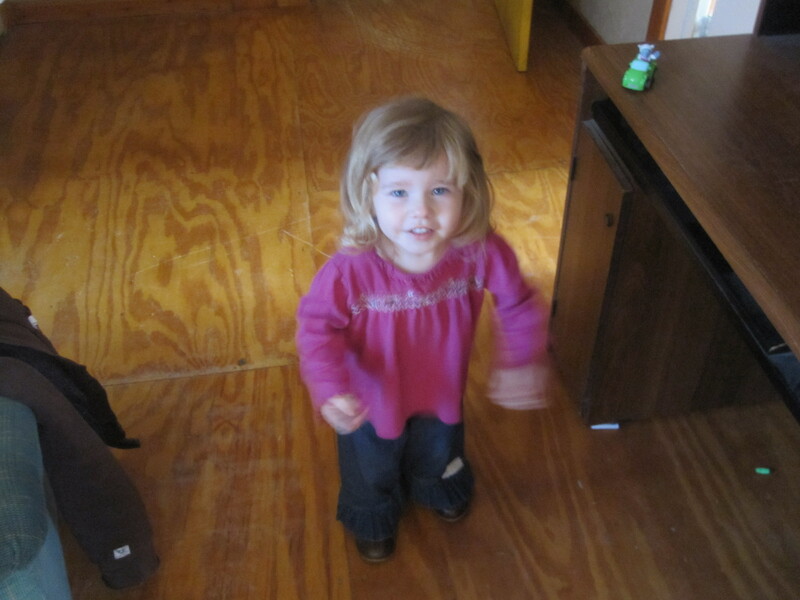 I might explode with joy when I see her take her “second” first-steps…I can’t wait for that day! The night has gotten away from me and I’m tired, but tomorrow I want to talk about Ziglar Women, a conference that I am (God-willing) going to be sharing at in a couple of weeks. Writing that here will remind me to talk about it! I can hardly have a cohesive thought these days so I have to write myself sticky notes to remind me to do things like laundry! So, I am reminding me: tomorrow share about Ziglar Women! 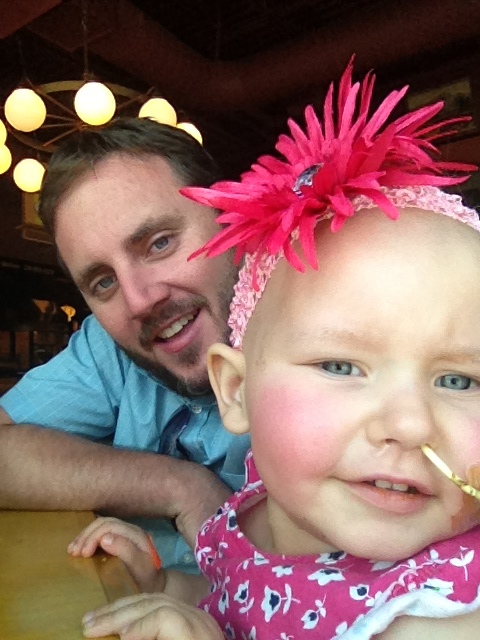 We will not know the nose swab test results until tomorrow, but it appears that Phoebe has a virus. She has typical cold symptoms; runny nose, a little cough, watery eyes and fever. She has been dehydrated and they have doubled her fluid intake so the last two days have been a juggling act with her Diabetes Insipidus. She is a little grouchy and sleepy, but otherwise does well when she is awake. Tomorrow is day eleven of this chemo cycle and on day 14 her blood counts usually make a reappearance, so we are watching her closely and praying for her immune system to reboot quickly. This round of chemo included a drug called Doxorubicen which is always very hard on her immune system knocking her counts down to zero and causing mucositis, painful sores throughout the lining of her mouth and digestive tract. 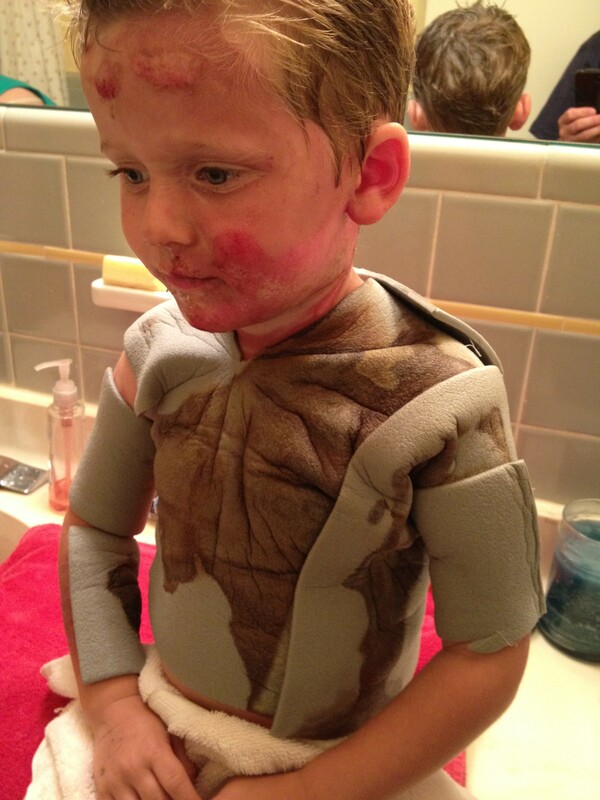 Deacon goes in tomorrow to have his Mepoplex foam pad removed and check up on his healing from the burns. His face is looking really good and most of the burned skin has peeled off now. He is very itchy, otherwise it looks like we might be in the clear as far as infection goes. I will update tomorrow after our appointment. Please pray that Phoebe’s immune system comes back good and strong and quickly so she can fight off this virus without any complications. Thank you all for your kind messages, cards and letters and prayers, we feel very blessed to be surrounded by such a host of loving people. 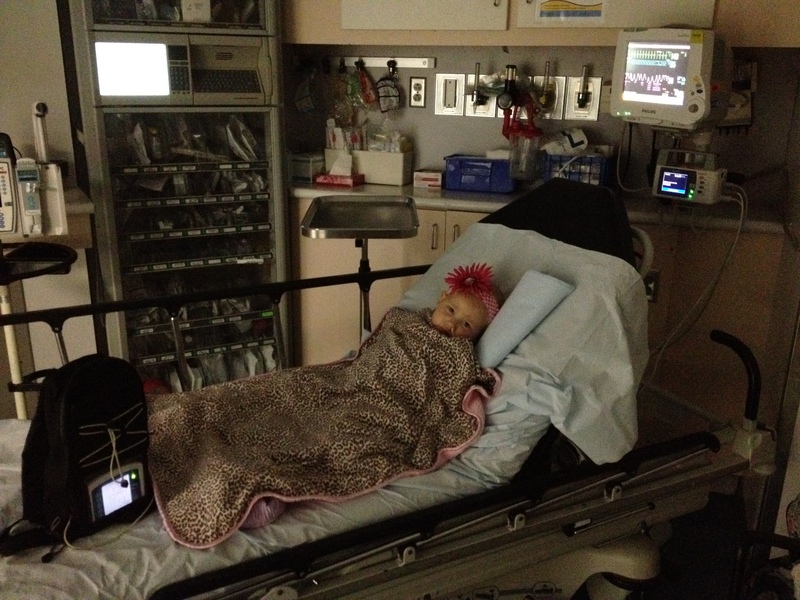 Last night found Phoebelicious at the ER until 4 am getting a blood transfusion for low hemoglobin…. I have to mention here what an awesome father my husband is. As soon as her fever spiked and we realized we had to take her back, I disolved into tears. He gladly volunteered to take his girl and didn’t even wake me up to take over when he got home. I texted him at 6 am letting him know she needed her shot not knowing he was in the bedroom next to me with Phoebe. I assumed they were still at the hospital since he hadn’t woken me up. I love this man. Phoebe is having a rough little time because she is once again being weaned from her final doses of Methadone. Today she had a lot of withdrawal symptoms; vomiting, yawning, fever, sneezing, watery – bloodshot eyes, shakiness, anxiety, irritability, sweating….you name it. It looks like we might have a rocky few days ahead as she continues to wean. Deacon is doing great and continues to improve each day. His face is peeling quite a bit and he is really starting to feel itchy which means that he’s healing up underneath his little foam suit. He goes in Friday to have it removed and see how things are coming along. The stares we get out in public with these two are pretty funny. 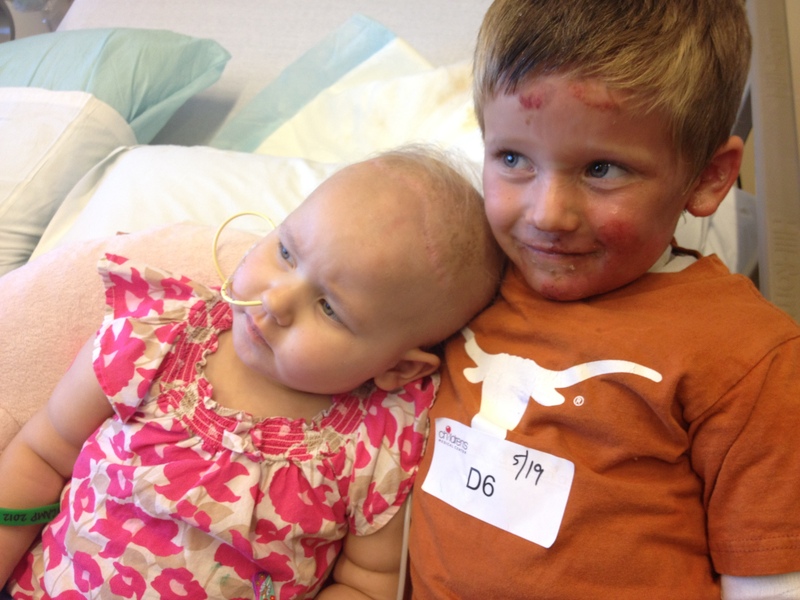 Phoebe’s bald head is a quick give-away that she is being treated with chemotherapy, but Deacon and his burned face and wrapped up body make people look twice. What a mess we are! Here’s to a week with our family intact, come what may! Phoebe came home today after her final round of induction phase chemo which makes our Fair home hospital complete. The new schedule began shortly after Phoebe arrived home when it became time for the bedtime routine. I have to share this here, because it will give you a glimpse of how our bedtime routine has changed in the last few months. Phoebe’s bed has to be outfitted with a Chux pad and cover blanket in case we have a night time accident. Her nebulizer mask has to be changed out and 6 some-odd pillows must be arranged just so. After I got Phoebe’s bed set up tonight, I gave Deacon his Loritab knowing that in half an hour it would be time for his uncomfortable washing and wound-dressing change. Nathan got Deacon in the tub for his “half-bath” and then placed him on a towel on the bathroom counter so I could wash his hair, gently clean his neck and face burns and apply his ointment. After this, I took off his bandages and cleaned the burns on his abdomen that are exposed. Deacon does not appreciate all this attention, but the Loritab is a huge help in making him more agreeable. Three rolls of bandages and a couple of guaze pads later, Deacon looks like an old timey football player. The Mepoplex foam stuck to his chest makes him look muscle-bound, which is really pretty cute. Whenever he is feeling self conscious about his burns we remark about how awesome it is that he looks like a football player. He eats it up. At midnight, Benjamin and Phoebe need meds. Benjamin is taking an antibiotic for his skin infection and it seems to be getting better. Unfortunately, the medicine he is on requires that he sit up straight for 10 minutes right after he takes it, so we have to wake him up at midnight, have him take the pill, then sit with him for ten minutes to make sure he sits up straight. I have no idea why that is required, but that’s what it says on the label! At some point after midnight we are finally allowed to go to sleep with our respective patients for the night. *Yawn…and then I set my alarm for 6 am when Phoebe will need her next shot. Crazy bedtime routine. Crazy life.